Oregon Migrant Leadership Institute focuses on creating a new educational vision and reality for migrant students. Oregon Migrant Leadership Institute participants building relationships and trust. Oregon lacks educational resources and programming for migrant youth. 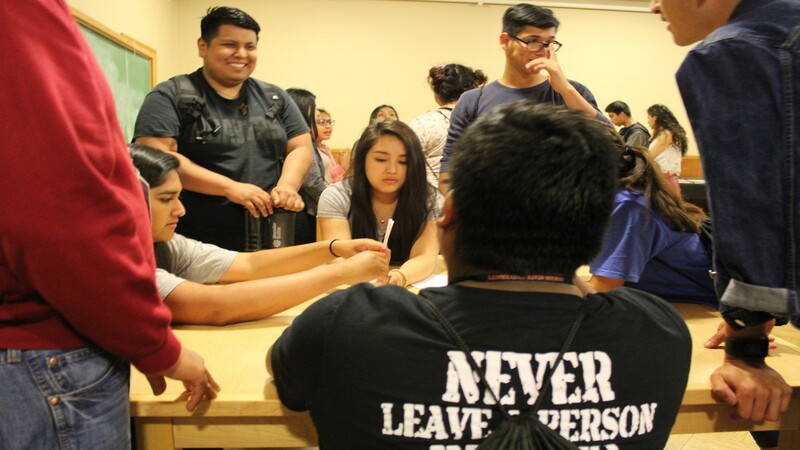 To address this need, Oregon State University collaborated with the Office of Migrant Education to create the Oregon Migrant Leadership Institute (OMLI). OMLI focuses on creating a new vision and reality for migrant students. OMLI is one of several programs at OSU—including Open Campus, part of the Division of University Outreach and Engagement—that help kids think about college as a possibility and part of their future. It was one of 10 programs singled out for a 2017 Vice Provost Awards of Excellence. Builds strong partnerships within the university and throughout Oregon (in OMLI’s case, Educational Service Districts, school districts and many other partners throughout the state). View their presentation at the awards luncheon here. OMLI’s objective is to develop leadership skills in Oregon’s high school migrant students. It exposes participants to college life and encourages them to attend. They also are encouraged to be proud of their heritage, and envision and build pathways to a positive future. OSU has hosted OMLI every summer since 2009. Many university resources and community partners work together to build an institute where participants engage in scholarship, leadership and transformational learning. The program provides opportunities for migrant students to interact with other students, mentors, faculty and staff, opening new horizons to their futures. Through the OMLI experience, students return to their schools prepared to participate in leadership activities. One OMLI expectation is for students to give back to their communities. 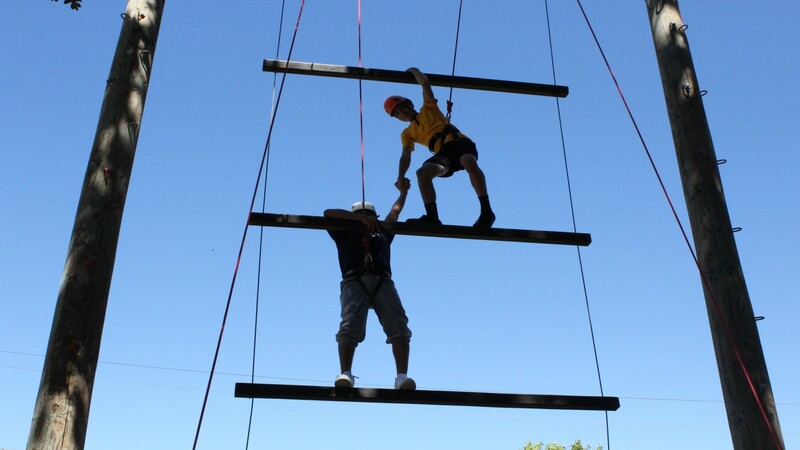 Oregon Migrant Leadership Institutes participants tackle the Oregon State University ropes course. Each summer, more than 100 high school migrant students from throughout Oregon make the trip to the OSU campus in Corvallis. Participants immerse themselves in a comprehensive leadership experience where relationships and trust are built, they begin to understand their potential and the importance of making good choices, and much more. Participants tell their stories through technology, art and creative writing. 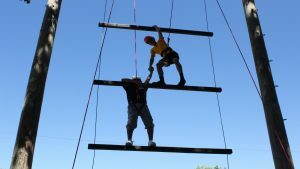 They challenge themselves and build trust in others on the ropes course. They learn about taking risks and learn from their mistakes. OMLI creates a supportive environment that creates positive change and growth. The impact of OMLI is immeasurable. From building self-esteem to aspirations of being the first in the family to attend college, the institute motivates participants. To date, nearly 1,000 migrant students have experienced OMLI. Pre-assessments show that only 50 percent of participants understood how to develop action plans for their goals and 62 percent were familiar with steps to problem solving. Post-assessments show an increase to 90 percent of participants expressing competency in goal setting and problem solving. In addition, assessments indicate that over 90 percent of participants plan to enroll in college after high school. Through OMLI, students become inspired about their education—they aim higher in their studies and emerge as leaders in their schools and communities. Many transition to higher education, including attending and graduating from OSU. OMLI gives hope to migrant youth in Oregon as the experience sets them on a different path to fulfill their potential. Check out this video to see more about the activities of the institute.